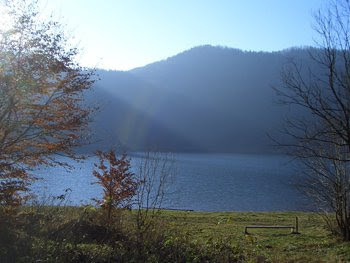 Situated in the mount Ciumatul Mare, on the left side of the river Olt, the lake Sfanta Ana rises on the bottom of an inactive volcano, named Ciomatu. The lake water is almost as pure as that of distilled water. You cannot find one living creature in the water, because of the lack of oxygen. Any beautiful place has a legend, this one has two. One of the legends says that once upon a time, a young couple was supposed to get married. The young girl, by her name Ana, who was about to get married, did not agreed with the marriage because her parents forced her to grab the young man’s fortune. She could not bear the thought of getting married with that rude boy whom she did not love. In the night of the wedding, the bride ran away and threw herself in the lake. Her body was never found. This is why, the locals named the lake Sfanta Ana( Saint Anne). Another legend says that, in the old times, in this places lived two tyrants which were brothers. One of them mastered a fortress on the top Puciosul and the other one a fortress situated on the place of the actual lake. The master of the fortress from the top Puciosu had a great carriage , fact that enraged hid brother and promised that he will come the next day with a greater carriage. To gain the promise, he harnessed eight of the most beautiful girls from the surrounding places. The beautiful girls could not move an inch the heavy carriage. The tyrant begun the to beat and whip the girls. One of the girls, named Ana, damned the evil master, and out of the blue begun a terrible storm, with thunders and lightning, and the fortress along with its master, was covered by fames. In the place were the fortress appeared a lake, and the locals named it Sfanta Ana. This are the legends, this is the place. A big beautiful blue lake on top of the mountain, a small cottage by the lake, providing you food and drinking, and the freedom to imagine. A road that circles the lake, separating it from the woods, will offer you a peaceful walk. If you are not in the mood for socializing, and just want to admire nature’s miracles and beauties, take the road and keep walking. Most surely you will find a place of your own. If you are a lazy walker, and wish for easy mountain likes, this is the perfect spot for you. Easy access, short hikes, beautiful landscapes, and the refreshing and conforting powers of water given to you by the beautiful lake. Romantic sunsets, relaxing times…The places is so beautiful it will give life to the artist within you. 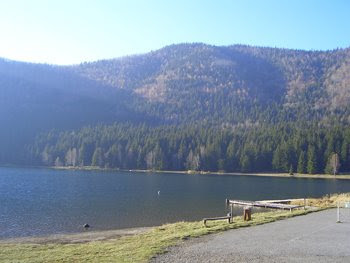 If you can’t make your mind between choosing the mountain or the sea, you can choose the Sfanta Ana lake. With maximum 7 meters depth, bathing is allowed. Daydreaming is suggested. If you are searching for a place to relax, to find your inner self, to run away from the city life, the stress at your office, your boss, capitalism, crashing cars, noisy parks, rude waiters, malls, everything that eats a part of you and loose yourself in this ocean called life, this is the perfect place for you my friend. Take a vacation, you will become a new man! Once you are here, you do not need to see the weather broadcast, the locals can tell how the weather will be. Two fissures formed in the mountain help them tell how the weather will be. The locals know that if the emanations are strong, it’s a sign that it will be a storm, if not, it will be a beautiful sunny day. The phenomenon is due to the fact that inside the mountain there is still a powerful volcanic activity, sensible to any change of the atmosphere.Mountain, lake, lake, sunbaths, peace, weather tellers, legends…want more? Go discover on your own!